German author; born at Breslau April 26, 1826; died Nov. 19, 1896. He was a grandson on his mother's side of the learned Abraham Tiktin, chief rabbi in Breslau and author of numerous learned works, and in his early years received halakic instruction from his uncle Solomon Tiktin, also chief rabbi in that city. His studies were completed in Hamburg, and at the age of twenty-seven he issued the first part of his "Mebo ha-Talmud" (Introduction to the Talmud), in which he endeavored with astonishing learning to trace a new theory of the development of the Halakah. But to perfect this new theory—a consummation which was never vouchsafed to him—he found it necessary to accumulate vast stores of learned material; thus he devoted extraordinary industry and acumen to the endeavor to formulate the principles upon which the 613 precepts of Judaism reposed. 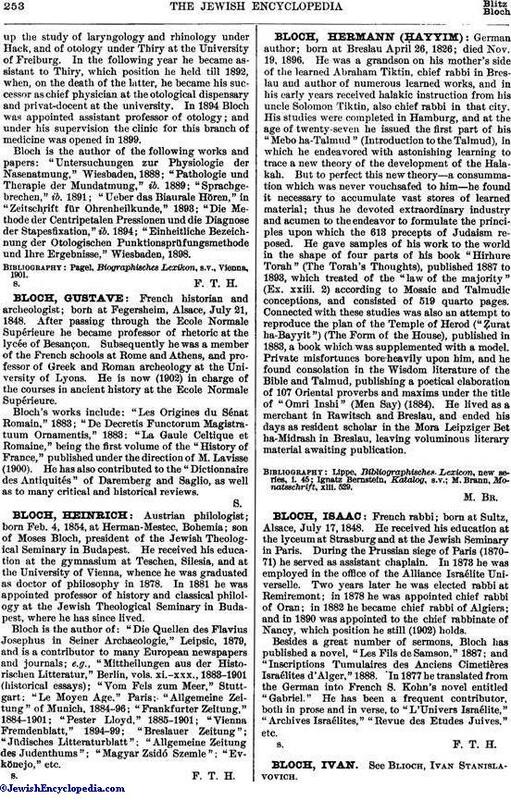 He gave samples of his work to the world in the shape of four parts of his book "Hirhure Torah" (The Torah's Thoughts), published 1887 to 1893, which treated of the "law of the majority" (Ex. xxiii. 2) according to Mosaic and Talmudic conceptions, and consisted of 519 quarto pages. Connected with these studies was also an attempt to reproduce the plan of the Temple of Herod ("Ẓurat ha-Bayyit") (The Form of the House), published in 1883, a book which was supplemented with a model. Private misfortunes bore heavily upon him, and he found consolation in the Wisdom literature of the Bible and Talmud, publishing a poetical elaboration of 107 Oriental proverbs and maxims under the title of "Omri Inshi" (Men Say) (1884). He lived as a merchant in Rawitsch and Breslau, and ended his days as resident scholar in the Mora Leipziger Bet ha-Midrash in Breslau, leaving voluminous literary material awaiting publication. M. Brann, Monatsschrift, xlii. 529.